At Key Stage 4 all students will follow the new AQA English/English Literature examination. The grading system has changed from A* to G and has been replaced with numbers 1-9, 1 being the lowest and 9 the highest. We now use Year 9 as a GCSE foundation year to ensure that all learners are supported for the challenge of entering both Language and Literature GCSE. The new GCSEs will be 100% linear examinations and will be sat in the Summer of 2017; in addition, there will no longer be a Controlled Assessment requirement for this course. Furthermore, English will no longer be tiered; all students will sit the same paper. Students will be given weekly homework booklets to prepare them for the new rigor of the exams, support for quotation learning via the PiXl Literature ‘app’ and extensive digital revision materials will be prescribed via Doddle and Kerboodle! 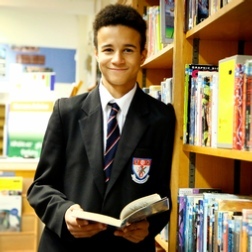 During GCSE studies, your child will explore a range of literary and non-literary texts from the 19th, 20th and 21st Centuries. Students will be taught to explore these texts in critical detail, probe and analyse textual details and to compare many technical elements. Our key Literature texts are: Romeo and Juliet by William Shakespeare, Blood Brothers by Willy Russell, A Christmas Carol by Charles Dickens as well as an anthology of poetry provided by AQA. Each half term, your child will complete: one formal reading exam style assessment and one formal writing exam style assessment that will be tracked against their target grad. Intervention will be suggested if your child is identified as needing extra support via our own departmental intervention teacher. Your child will also have numerous opportunities to complete Walk and Talk mock exams, formal PiXL mock exams as per the school exam calendar as well as weekly tracked tasks that are set in class.